Different readers look for different things in Science Fiction. Some want escapist adventure, others want social comment or satire - and there are plenty of excellent outlets for these forms of the genre. But if you're looking for a LITERATURE OF IDEAS, there's only one place to start -- John W Campbell's Astounding Science Fiction magazine. Throughout the 1940s and 50s this was the home to SF's leading "ideas men", including such greats as A E Van Vogt, Eric Frank Russell and Henry Kuttner, and others less well known such as Raymond F Jones, H Beam Piper, Randall Garrett and Mark Clifton. It also saw some of the earliest publications by such household names as L Ron Hubbard, Isaac Asimov and Robert A Heinlein. 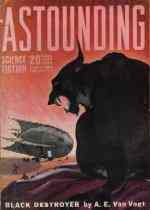 Campbell took over the editorship of Astounding in October 1937, but it's generally acknowledged that his definitive style only became fully established with the July 1939 issue (containing the first stories to appear in the magazine by both Van Vogt and Asimov). Astounding continued at full pace until 1960, when Campbell changed the magazine's name to Analog. There was a handover period during which both logos appeared - the final issue to bear the name Astounding (very faintly behind the Analog logo) was dated September 1960. My original purpose in setting up this site was to provide a comprehensive listing of all the science fiction stories (and factual articles) appearing in Astounding during the period July 1939 to September 1960. Many of these stories are still widely available on the second-hand market (or in some happy cases, still in print), in anthologies and collections and the book versions of serials, as well as the original magazines and (if you live in the UK) their British Reprint versions. But it's still helpful to see how the stories fit together in chronological sequence, and which appeared alongside which on their first publication. It's also awesome to see just what a huge proportion of the great SF of the period first appeared in this magazine. Rocket to the Morgue -- a 1942 murder mystery featuring John W. Campbell and Astounding!